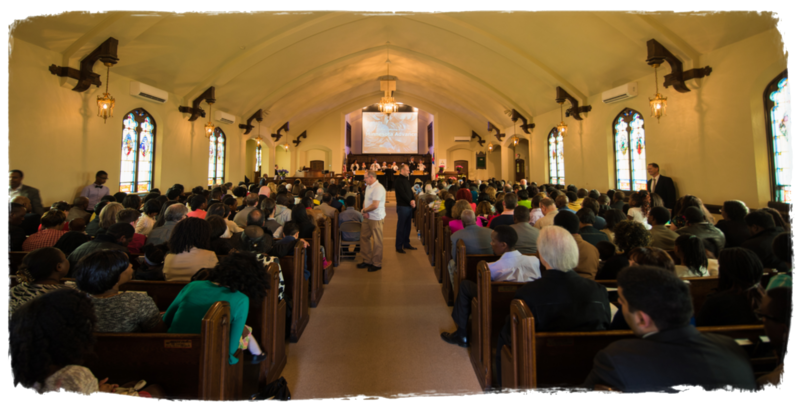 Three words describe the philosophy and evangelistic practices of the Southview SDA Church in Minneapolis, MN; Uplifting, Building, and Enriching. Like almost any pastor, I would love to say that when I arrived here two years ago that I set this vision from the beginning and that my ideas caused the dynamic growth we are experiencing. Here is an honest confession, when we held our first public evangelistic effort two months after I arrived and we baptized twenty-five people without mailing a single handbill for a few seconds I was tempted to think that I was God’s gift to His church. But as I began to hear more and more of the stories of these new members, the same theme kept coming up, “Your church reached out to me in a time of need”; “I met several of your members at a monthly get together of friends”; “I can’t believe that I’m a member of your church because I started playing basketball at your school on Thursday nights”; “One of your members called me every night for a month to pray with me when I had lost all hope”. I was humbled. The success of those meetings had everything to do with the involvement, and connections that this church was making with the community. This work had begun long before I ever arrived during the successful ministry tenure of the pastors who had come before me. As the church continued to grow (in two years we have added 125 new members and a large majority are new Christians) it forced us to look to our future. Our building could no longer hold our growing family. But before we could think about our next steps, we had to prayerfully take inventory of exactly what God has been doing here. As we pondered the blessings, those three words shared above emerged out of this process. It became clear that Building (Community), Enriching (Lives), is Uplifting (Jesus). Our church is filled with people who understand that the Ministry of Presence is the ministry of the Word; and when the presentation of the Word becomes an extension of the Ministry of Presence, a dynamic connection to Christ’s Church begins. The following is a description of how we put those three words into practice within our Southview family. First, a disclaimer: In my experience I have become convinced that outreach must be highly contextualized to your city. Cookie Cutters don’t work. I hope that you can take some of these principles and they will be an encouragement to your ministry, or give you ideas for the place God has put you. Southview Elder Victor Pechaty puts our emphasis on community this way, “It is our goal to foster an evangelistic culture that grows out of a genuine and perpetual love and concern for everyone in our community within and outside the church. Defining “evangelism” as a deep and abiding concern for others, seeing them through the eyes of Jesus Christ, supports an authenticity in Southview ministry that is sometimes lost in conventional evangelistic programming”. We have learned together that authentic community happens when relationships of mutual trust are formed among our members and with anyone we encounter in our broader spheres of influence. Through community and the bonds of friendship, the message of Jesus emerges often organically and naturally. We have encouraged each other to build community around any interest that can be shared by a “Life Group”. This includes religious pursuits such as Bible Study, church choir, etc., but also hobbies, sports, volunteerism; anything that presents an opportunity for fellowship in the context of Christian life. Over time, I have witnessed small group initiatives rise and die off with regularity. Within the Southview culture breakfast clubs, men’s basketball, biking, music groups, and other seemingly non- spiritually focused get togethers have been going on for years and have produced the fruit of bible studies and baptisms. Discipleship is established through these connections; friendships that began with no other motive. As a church board we have begun to give resources traditionally reserved for preaching, to our Life Groups so that they have all they need to be successful. Over forty percent of our congregation is active in some type of Life Group. We have documented well that people who come to our public preaching efforts that have previously connected through a Life-Group are already well on their way to being a disciple, and the majority of them make decisions at our meetings. Because of this, the themes of our public meetings and worship services come from the life and needs of people engaged in these smaller communities. This makes church and its ministries feel like an extension of their Life Group. Central to our community building philosophy is an emphasis on celebrating diversity. At Southview we have at least thirty different nations represented at our church every Sabbath. We believe that vast diversity is a great benefit to the church and is a part of the fulfillment of the Gospel. We hold events and support Life Groups that will encourage people to bridge natural barriers made by nationality, and culture. One amazing benefit to this emphasis is that young adults who previously became disillusioned or had been on the fringes of the church are being engaged by Southview YAs from other cultures and this exposure is drawing them back to us. Our city is a place where there are many people, yet these people are increasingly lonely. An emphasis on building community gives people a sense of belonging, which opens the door to believing. A deep dedication to building community with people from various walks of life has convinced Southview of the need for the church to provide programs, resources, and opportunities to enrich the lives of people we are spending time with. We work tirelessly to make our church a place that meets needs that the smaller Life Groups do not have the resources to satisfy. We believe that these ministries should reach people from the personal level to an even broader context. Southview takes seriously the words of God to Jeremiah, “Work for the good of your city, and where I have sent you into exile, and pray to the Lord on its behalf, for in its welfare you will find your welfare” Jer. 29:7. We believe as Ellen White did that as you provide education and enrichment for people it raises their self respect, which has a powerful effect on their ability to open their heart to Jesus. We live in a city that is very multi-cultural so we have sought to provide opportunities that address the hopes of people cross-culturally. For example, our worship leader Dr. Cheryl Saunders, has discovered that music ministries and education are a powerful tool for enriching lives. Southview’s Children’s Choir utilizes multiple languages to assist in teaching immigrants and their children English, and musical harmony. This effort also allows English speaking children the ability to learn and appreciate diversity. Nearly 70 children of members and nonmembers are active in music education at Southview. Every formal ministry at Southview is dedicated to people. Because of this emphasis, our members feel comfortable bringing friends from their Life Groups to our church because they know it is a safe place where they will find the help they need, or someone who knows where they can get that help. An example of this kind of ministry focus that is outside the usual comfortable ministry approach took place recently when pastors and Southview YAs went to a St. Paul Black Lives Matter protest, not as a political statement but simply to pray with hurting individuals. This effort resulted in hundreds of protestors, and police praying and sharing their fears with our members. These connections were life changing for many of us. We have a dream that our next facility will be an even greater center of influence focused on enriching lives. “Building Bridges” is common phrase and mantra at Southview. We are building friendships with partner organizations that are serving the hungry, providing housing for the homeless, providing counseling, and many others that may offer services and ministries that Southview is not equipped to support or others who will do better. This openness is building new relationships, allowing us to reach and support more people and, frankly, dismantling preexisting barriers and misconceptions about Seventh-day-Adventists and our mission. These bridges create a natural progression from Life Groups (Building), to formal ministries (Enriching), to public evangelism (Uplifting). sustain the traditional cycle of evangelism that was all designed to lead to a three week preaching event in the fall. Being largely program and not people focused my previous congregations understandably struggled to get people to our church, and connect with them. This resulted in low attendance at our meetings along with discouraged people at the end of the cycle. Within this process, God would continuously put in my mind a thought; we do a great job of telling people about the Great Controversy, but we do a very poor job of helping people to live through it. When I got to Southview it allowed me to see how putting an emphasis on people and community first makes connecting people to the church, and our last-day message exponentially easier. In our first two public evangelistic efforts we baptized over forty people without mailing a single flyer. Early on in my ministry I would spend a lot of sermon time telling people about the doctrinal failures of other denominations, but would turn to talking about Jesus near the end to make an appeal to the heart. Some time ago I decided to focus only on truth. The emphasis on people and building community at Southview has helped me understand how to do this better. Because our members are so gifted in connecting with people, I realized that we needed to make our church services and all of our public meetings feel like and extension of those Life Groups. The themes, and songs at any of our services are meant to show people how Jesus is the solution to their situation. Last year many of our members and their Life Group friends experienced the loss of loved ones. We decided that the theme of our fall meetings would be “Almost Home”. In 10 nights, we uplifted Jesus to speak directly to the situations of these hurting individuals. Out of this theme, the usual testing truths flowed naturally. Our focus was not what we needed people to believe to be baptized, but how Jesus is speaking to them in those moments of their pain. The strength of this approach is that by speaking into the real life situations of people with the Gospel, they are hungry to engage more with the Life Group friend who brought them the meeting. This friend is then either empowered to study more with the individual, or is able to point that person to one of our new believer Bible studies. Sometimes God moves and we are forced to try and keep up. That is exactly what is going on at our church. We are being asked to watch closely what God is doing. I can boast no more holiness or skill than you, and I am so thankful for the lessons that God is teaching us here. I am thankful that God has placed me among these people who understand the power of community, and are dedicated to enriching lives, so that we together can uplift Jesus to our city.